Our organization is standing in the league of leading firms that are offering Acid & Alkali Resistant Tiles to the clients. These products are manufactured using high quality raw material and latest tools & techniques at our infrastructure. We follow different methods in these products like tiling using very thick acid resistant bricks, epoxy coatings and vitrified unglazed tiles. Our firm also deal with colored epoxy grouts to fill up these tile joints. 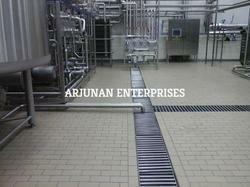 Looking for Acid & Alkali Resistant Tiles ?